Valerie Kinloch is the Renée and Richard Goldman Dean of the School of Education and Professor at the University of Pittsburgh. Her scholarship examines the literacies and community engagements of youth and adults inside and outside schools. Author of publications on race, place, literacy, and equity, her books include: Still Seeking an Attitude: Critical Reflections on the Work of June Jordan (2004), June Jordan: Her Life and Letters (2006), Harlem On Our Minds: Place, Race, and the Literacies of Urban Youth (2010), Urban Literacies: Critical Perspectives on Language, Learning, and Community (2011), Crossing Boundaries: Teaching and Learning with Urban Youth (2012), and Service-Learning in Literacy Education: Possibilities for Teaching and Learning (2015). 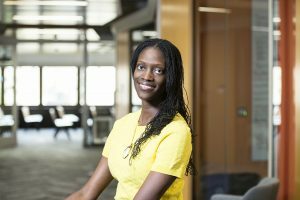 In 2012, her book Harlem On Our Minds received the Outstanding Book of the Year Award from the American Educational Research Association, and in 2014, her book Crossing Boundaries: Teaching and Learning with Urban Youth was a staff pick for professional development by Teaching Tolerance magazine. Currently, she is completing articles and book projects on literacy, justice, race, engagement, and leadership. Among other awards, she is recipient of the 2018 NCTE Rewey Belle Inglis Award for Outstanding Women in English Education. To recognize a person of color who has made a significant contribution to NCTE and to the development of our professional community. This award will be bestowed only when the APCL Selection Committee decides a nomination warrants presentation of the award. This award may not be given each year. This award may be given to a deceased person. People of color refers to historically underrepresented groups: African American, American Indians, Asian Americans, Latinos, and Pacific Islanders. The APCL Selection Committee will only consider nominations solicited from the Board of Directors, Affiliate Presidents, Caucus Chairs, and NCTE members of color. The Executive Committee will approve the committee’s selection. The bold statements are the award criteria. The remaining statements are intended to describe some of the possibilities suggested in the criteria and are not intended to be rated individually. Please remember that different individuals have different levels of access to various opportunities (for example, rural vs. urban instructors). In other words, what is the level of the nominee’s contribution based on the level of opportunity, resources, and support? Strong candidates tend to show strength in all four areas. A plaque is given to the recipient during an awards ceremony which takes place at the NCTE Annual Convention. Nominations from the Board of Directors, Affiliate Presidents, Caucus Chairs, and NCTE members of color should be submitted by June 1, 2019, to NCTEAwards@ncte.org.